Wire Fraud and Mail Fraud is any fraudulent scheme to intentionally deprive another of property or honest services via mail or wire communication. It has been a federal crime in the United States since 1872. Wire fraud, in specific, is a serious criminal charge consisting of someone defrauding another of money, property or services through the use of electronic means, such as requesting a wire transfer from a bank by radio, telephone, modem, Internet, fax, etc. If you are under investigation or have already been charged for wire fraud, you need to be aware that this is a serious federal crime that is backed up with equally serious punishment and penalties should you be convicted. If you are nervous or frightened, you should be. Frankly, you are facing the unlimited power of the federal government; often combined with one or more state government agencies – ALL ALIGNED AGAINST YOU – a lone individual. It’s a scary thought. Furthermore, when someone is accused or charged with wire fraud, chances are significant that the BOTH the accused and the all the pertinent facts have already been exhaustively investigated by a federal agency. Moreover, because federal agencies have essential bottomless pocketbooks, you can usually assume that all the “i’s” were dotted and all the “t’s” were crossed before any charges were actually filed. Because of that, the case is probably pretty solid and it is imperative that you consult a federal criminal attorney to protect your rights and get a look at what evidence the government has against you. In such a situation, the only option you have to to get the power of the LAW on your side to level the playing field. You should absolutely consult with an experienced and compassionate Southern California criminal defense attorney who can stand by your side and take some of that stress off your shoulders and then stand by you throughout the entire process. Once you have a lawyer on your team you might have a restful nights’ sleep. 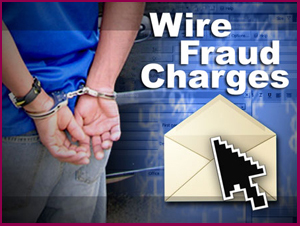 A conviction for wire fraud can cost you up to 30-years in prison and up to $1,000,000 in penalties and fines. Like many other serious felony crimes, if you were to be convicted on these charges your reputation will often be ruined, your current employment in jeopardy and any future employment opportunities may completely dry up. You should get a criminal defense attorney on your side to work to get these charges dismissed or reduced if possible; and if this case should go to trial you absolutely need a skilled trial attorney to get you the best possible outcome. Doing nothing; attempting to argue against the government on your own; to plead no contest or guilty is a one-way ticket to accepting the maximum punishment, maximum jail time, and maximum monetary penalties that the system can and will gladly dump on you. It is always better to have legal counsel who may be able to make the investigation or charges go away through a thorough investigation of the government’s case as to (1) the facts of their case, and (2) the law. If no holes are found in the facts or the law, often the government is willing to quietly negotiate without having charges filed -or- if charges are already pending, may still work out a deal short of trial. Such a “deal” would also avoid a lot of pain and will often prevent your name and reputation from being made part of the public record. Finally, should the government be steadfast in coming after you, competent legal representation will ensure that you can fight the government in trial and win there, or if a win is just not possible you will be able to negotiate a far better result than you would without competent counsel. Vincent W. Davis is a criminal defense lawyer who is skilled, experienced and aggressive and will build a vigorous defense to protect the rights and freedom of his clients.